formerly Innsmouth Hills Sanitarium in Long Island. Powers: None, though Dr. Paine is completely unable to experience tactile sensations, making him immune to all forms of physical pain or pleasure. Paine also wears metal gloves with detachable surgical tool fingertips. Dr. Paine has a group of trained foot soldiers, dubbed his "Orderlies" to carry out missions for him. (Morbius the Living Vampire#4 (fb)) - Thaddeus Paine was a brilliant surgeon, who fell victim to a horrible accident involving an experimental anesthetic. Losing all tactile sensation, Paine became obsessed with medical freaks, falling prey to madness as his own inability to experience pleasure or pain took hold. Perhaps seeing that his own condition seemed meaningless, Paine began seeking out terminally ill individuals in the hopes that he could take their deaths and give them some sort of importance or meaning. Backed by a group of thugs that he dubbed the Orderlies, Paine began conducting ruthless experiments on his "patients," experiencing a visceral thrill from operating on them without anesthesia. (Morbius the Living Vampire#1 (fb) - BTS) - Paine's network of contacts eventually included Dr. David Langford, a corrupt biochemist who befriended Martine Bancroft, the estranged fianc� of Michael Morbius. Langford promised to aid Bancroft in finding a cure for Morbius's bizarre form of pseudo-vampirism and was given access to the man's many unpublished papers. Langford intended to kill Morbius and sell his papers to Dr. Paine, who grew increasingly curious about the Living Vampire's condition. Langford's plan never came to fruition, however, as Bancroft uncovered his deception and turned on him. Forced to kill Morbius's lover, Langford soon fell victim to the Living Vampire's wrath and was slain. (Morbius the Living Vampire#3 (fb) - BTS) - Learning of Langford's death, Paine dispatched the Orderlies to capture Morbius. 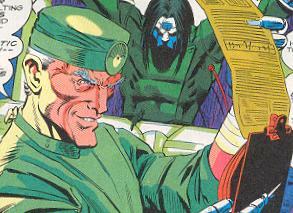 The Orderlies managed to locate him during an altercation involving Spider-Man and Simon Stroud. Morbius was reeling from a series of tranquilizer darts fired into his system from Stroud and was unable to avoid being taking away by the Orderlies. (Morbius the Living Vampire#4) - Paine began an in-depth study of Morbius, holding the Living Vampire prisoner. Deprived of blood, Morbius was too debilitated to resist as Paine began sharing his life's work with him. Paine viewed Morbius as a colleague, admiring much of Morbius's research and his relentless drive to survive. 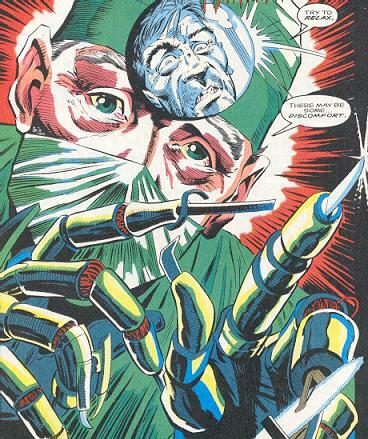 Paine allowed Morbius to tour his facility and forced the man to watch as Paine conducted brain tumor surgery without any anesthesia for the victim. Paine's philosophy that "Life is Pain" infuriated Morbius and the Living Vampire only grew more angry when Paine revealed that Morbius's disease was not in remission at all -- in fact, it was still killing him. Morbius used a tremendous rush of adrenaline to break free at this point, overwhelming the Orderlies as Paine rushed to safety. The mad doctor escaped that night, though Morbius swore that he would eventually bring an end to the horrific experiments of Dr. Paine. (Venom: The Hunger#2) - Paine re-established himself in Long Island, opening the Innsmouth Hills Sanitarium. There, he was contacted by Bellevue Hospital, who sought his consultation on the matter of a John Doe that had been brought in by the police, ranting about brain-eating aliens. The John Doe was actually Eddie Brock, who had been temporarily separated from the symbiote that shared his existence as Venom. Though Paine initially believed that Brock was mad and suffering from Organic Brain Syndrome, a series of painful experiments proved otherwise. Finally accepting Brock's story at face value, Paine began coveting the symbiote for its medicinal purposes. He forced Brock into a hypnotic state, during which he was able to learn more about the symbiote's need for human brains and its mindset at the time of separation. Paine then allowed Brock to escape, in the hopes that he would eventually lead them to the alien lifeform. Paine had placed an implant inside Brock without the patient's knowledge, one that would allow the doctor and his Orderlies to track his movements. (Venom: The Hunger#3) - Thanks to the tracking device, Paine continued to monitor Brock's attempts to track down the symbiote. Soon afterwards, Brock managed to locate his "Other" and was in the process of re-bonding with it when the Orderlies arrived, knocking out Brock and stealing the symbiote. (Venom: The Hunger#4) - After making his rounds at the Sanitarium (during which he refused to end one suffering patient's life because "physician-assisted suicide is highly unethical), Paine learned that the symbiote had arrived. After conducting a series of torturous experiments on the symbiote, Paine was forced to temporarily call a halt to the proceedings when Brock returned, seeking to free his 'Other.' Brock succeeded in doing so, killing many of the Orderlies in the process. When Paine informed the re-formed Venom that physical torture would not work on him due to his lack of pain sensitivity, Venom injected a portion of his alien body into Paine's brain, sucking it dry of phenethylamine. This sudden deficiency mirrored Venom's own hunger, one that could be filled only by the ingestion of human brains -- and lots of them. Filled with a ravenous hunger, Paine began devouring the brains of his patients and Orderlies in order to survive. Presumably, Dr. Paine is still out there, conducting his sordid medical experiments -- but now also cursed with a desire to feast upon the brains of his victims. Comments: Created by Len Kaminski, Ron Garney, and Mike Witherby. Way to solve the problem, Venom! Take a guy who enjoys torturing people and has access to helpless patients, and give him a desire to consume human brains!